Over the last several months I have been working my way through the ever popular Mastering AutoCAD Civil 3D 2008 book, written by the gang over at Civil3D.com (Engineered Efficiency). As a fellow member of the blogosphere, I have had the privilege to establish a professional relationship with a good portion of the Engineered Efficiency (EE) team. For those unfamiliar with EE, they are arguably the best Civil 3D implementation team in the business! I’ll never forget last spring when I went to the Experience the Possibilities Tour in Washington DC. During the presentation I asked a question about Civil 3D that was in fact both rather detailed, and quirky. The Autodesk representative answered the question, but with some loose ends remaining. After the session broke, Dana Probert of EE (who I had never met in person), found me in the crowd to both answer and explain the details about the feature I was questioning. My point in sharing that story is that the EE team has many years of experience solving the real-world problems firms implementing Civil 3D. More importantly they simply know how things interconnect within Civil 3D, and can easily recommend the best approach to a given situation. To that end, the book has been structured in way such that you are learning best practices as you go. Taking that one step further for many of the complex concepts, the Mastering AutoCAD Civil 3D 2008 book expands on the why and how of many details. Although the book does provide an explanation for nearly every option in every dialog, the book is not one of the AutoCAD Bible books. In my experience the Bible books have served more as a desk reference, not a learning tool. The Mastering AutoCAD Civil 3D book is written more as a textbook than a desk reference. Each topic is concluded with an exercise whose dataset is provided with the included CD-ROM. Making the CD-ROM even more valuable is the way chapters are broken down. Chapter 12 on advanced corridors is broken into enough pieces that you could easily pick up the book and work through intersections today, culs-de-sac tomorrow, and widening the day after that. Admittedly the book can come across as rather elementary at times, well below the mark for more advanced users. Personally as I worked through the book I found myself completing the exercise included in the book, but then applying the same concept in a more advanced way. For instance, you can easily take the cul-de-sac exercise and make it a little more complex by adding a shoulder and sidewalk. Still if doing that is still too elementary for you, there are numerous chapters that in my opinion are more for the CAD Manager than the CAD user. For instance topics such as styles and the dreaded part builder are covered in addition to the basics. At the end of the day, a person who completes this book should have a rather through understanding of Civil 3D. Even if you don’t read the book cover-to-cover, chapters are broken down such that you can easily use it as a learn-on-demand resource, pulling it off your bookshelf only when you need to use xyz feature. Quite simply if you use Civil 3D, YOU NEED THIS BOOK! el civil 3d es una completa mierda, lo que se quiere es hacer ràpido el trabajo y no estar configurando ventana tras ventana como se hace en este programa que es una caricatura de eagle point, y la produccion final de planta y perfil es una total mierda por que no es como en el land desktop que era intuitivo y adaptable a las normas de presentacion de planos de los distintos paises en cuanto a las secciones es peor todavia, no se adecua ni a las escalas, y si tiene esta posivilidad, donde mierdas estara para modificar. en resumen el civil 3d es una total mierda. Truth is does it matter, I mean our careers, like the $#@! we’ve designed to slide down toilets, is going down the drain (kiddin’ guys/gals… I know know… always need civil designers… blah blah blah… I’ll probably get out of this godless career anyways… who knows. BC – This is the most advanced book I know of. Mastering really does take you through nearly every part of Civil 3D with language a tech-savvy beginner can comprehend, and enough detail to benefit an intermediate/advanced user. For what it’s worth, nearly everyone I have talked to at Autodesk has told me that Mastering is the defacto desk reference for the folks at Autodesk. Starting with the 2009 release, there’s a new Introducing book that falls more into the ballpark of dear Watson. OK I guess I deserved some of that… I was not bashing the guys at EE, I did mention they have some good talent and although I did not say it here I do believe they provide good service to the industry. I’m also not bashing EE’s Mastering Book. It is well written and provides good material, better than many other I’ve seen. And yes Scot, you are correct a review and a comparison are two diffent things. I was giving him crap, I know how long he has been in the industry and no I don’t feel he has been around long enough to know the others that are out there who have been doing this a very long time and doing just as good as EE… There are also many who don’t have a clue… Again don’t get me wrong Donnie is smart and knows his stuff and does a great job… I’ve been in this industry a very long time myself and there are many Consultants out there who I would consider very good, better then I ever could be. I never would claim to be the best and don’t believe anyone knows it all and personally would not want to be labeled the “Best”. If your the best there is no room for improvement and there is always room to improve. I am confident I know what I’m doing and how to do it, and that I do it very well, and make a good living doing it, and there is always more to learn. Donnie – I apologize to you and the others if my comments were out of line. I meant no harm. Thanks for the kind words about Mastering. It was a labor of love- we did our best to write the resource manual that we (the authors) wished we had handy when we began working with Civil 3D in production and when training clients. I have a copy open on my desk right now, and I find that I look to the text for reminders, ideas and reference all day long. We are working on the next generation of Mastering, and I hope that we can continue to make a quality text that will make learning Civil 3D more accessible to the masses. I believe that better design can make this world a better place to live- and I think that the dynamic iterations available in Civil 3D can take us from good projects to great projects. I hope that everyone out there takes advantage of whatever learning material they can in order to fully embrace this software, and improve the quality of their land development projects. With my many discussions with Mark S. he has always been extremely knowledgable on whatever the topic was. This goes for all of the people that he has brought onboard with EE. I like to think that the brigthest minds work for Mark as he is VERY selective of the people he speaks with and hires. Having had interaction personally with almost all the members of EE’s team I would say that you sir are 100% incorrect. EE can claim to be the best because they do have the talent to back that up. However, I’m just a lowly CAD manager so take that for what it’s worth. 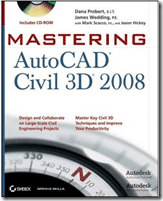 I don’t think it is necessary to review other books just to have the opinion that Mastering Civil 3D 2008 is good. If Donnie were to say that Mastering Civil 3D 2008 was THE BEST, well yes, a point of comparison would be required. As for the quality of this book, all I can say is that if you walk around the floor where my office is at Autodesk, you’ll find more than 1 copy. And as for EE, my experiences have all been very good. As someone who hires consultants – EE has provided the absolute best service, the best knowledge base, and has been of great value to myself and Joseph A Schudt & Associates. I’ve trained with others before, but no one has the depth of knowledge as the group at EE. While the publishing world rushed to publish a couple of Civil 3d books before Mastering came out (I’ve got a few on my shelf as well), it is the easiest to read, has great examples. Donnie’s review of Mastering is great and he identified some of the weakness of the book. But the book is full of great information. Hands down, the EE is the Best in the business. And they have an awesome book too! I am glad that I know them. How can you state EE is the best when you have little to no experience on the Consulting industry? I understand you are on the EE band wagon, and don’t get me wrong they have some good people and knowledge, but “the best” come on. I know many consultants with a lot more experience than the group at EE. I also question your review of this book without reviewing other material out there for a true comparison. Does that mean the “YOU NEED THIS BOOK” link is directed to the wrong item? That’s what I don’t understand. You’re discussing the Mastering book but then linking to (and recommending) the CAD Bible. Mitch – My mention of the “Bible” series was made simply as a comparison between titles. This Mastering Civil 3D title is written more as a textbook than a reference book. The Bible books tend to focus on commands more than concept, hence their function as a reference book. This Mastering book focuses on complete concepts, rather than specific commands. To my knowledge an AutoCAD Civil 3D Bible does not yet exist. I’m really confused here. You talk about the Mastering book throughout your post but at the end recommend an entirely different book? If you are recommending people buy the CAD 2008 Bible over this one, do you have any recommendations for people looking for a Civil 3D 2008 “bible”?